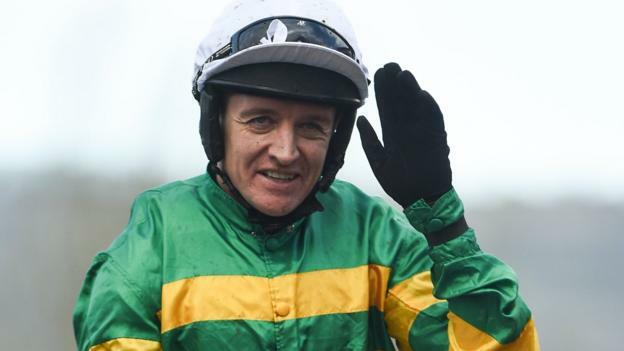 Jockey Barry Geraghty is in hospital with a leg injury after a fall at Aintree on the eve of the Grand National. Geraghty, 39, had been due to ride top weight Anibale Fly on Saturday and a replacement is set to be needed. Fellow rider Mark Enright was also taken to hospital after falling from his mount in Friday’s Topham Chase. Two horses – Forest Des Aigles and Crucial Role – were fatally injured on the second day of the meeting. The Dan Skelton-trained Crucial Role fell in the Mildmay Novices’ Chase, while Forest Des Aigles, trained by Lucinda Russell, was injured when in contention approaching the final fence in the Topham Chase. Their deaths are the first at this year’s Festival. Geraghty clutched his leg after falling from Peregrine Run, and was stood down for the rest of the day, with Mark Walsh replacing him on Champ, who won the following Sefton Novices’ Hurdle. Anibale Fly, trained by Tony Martin, is about a 14-1 chance for the National after coming fourth in the race last year and finishing third and second in the last two runnings of the Cheltenham Gold Cup. Geraghty won the National in 2003 on Monty’s Pass and is the second most successful jockey at the Cheltenham Festival after Ruby Walsh. All the runners and riders have returned safely in the last six Grand Nationals after a series of safety improvements at the track, but British racing has been under pressure from politicians and welfare groups to improve its overall record. There has been one equine death in the past two editions of the Festival. However, four horses died in the 2016 meeting, with another two destroyed in the following days, in part due to injuries sustained that year at Aintree.